Great job, David. 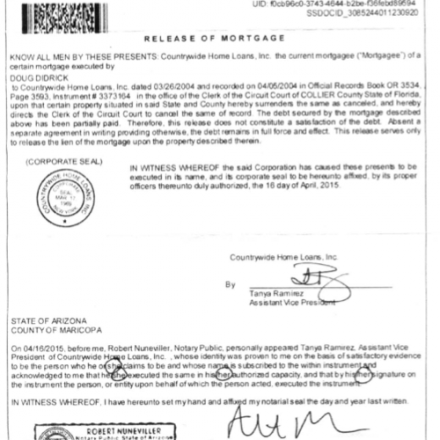 And yes, foreclosure is still happening despite the financial analysts and banks are still stating that foreclosure is declining… A digitally notarized document? Now that is the newest fraud tactic. Chain of Title: How Three Ordinary Americans Uncovered Wall Street’s Great Foreclosure Fraud, is about three foreclosure victims who ended up doing more investigation of the corrupt U.S. mortgage industry than any state or federal law enforcement or regulatory official. Here at The Intercept, in the past 10 months, I’ve written about the New Jersey man who had precious family heirlooms robbed by Wells Fargo subcontractors when they illegally “trashed out” his foreclosed home. 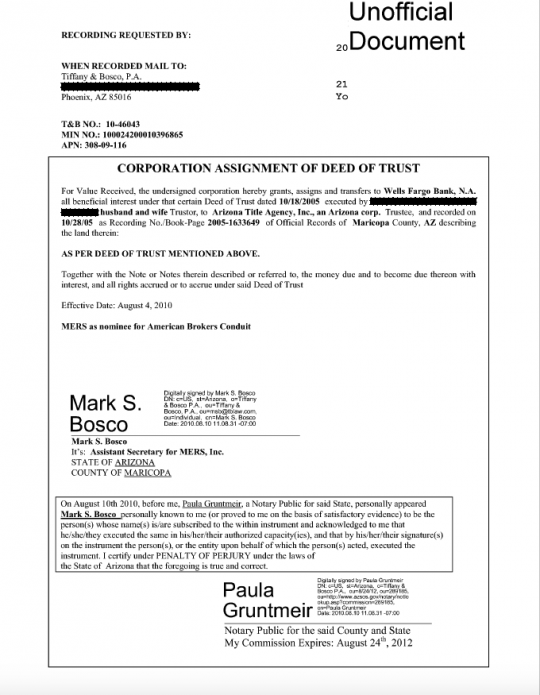 I’ve written about the use of false documents in Seattle and the unregistered business trusts operating in Montana. I’ve written about the Texas jury that awarded $5 million in one wrongful foreclosure case with fabricated and robo-signed documents. I’ve written about the California Supreme Court enabling foreclosure victims to challenge phony documents in their cases. 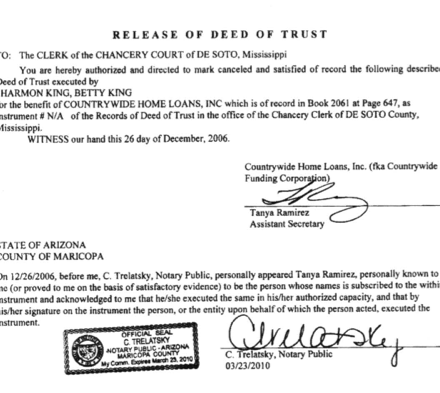 Here are some documents from a “Tanya Ramirez”, signing as an officer of Countrywide, Bank of America, Recontrust, New Century Mortgage, and MERS (an private electronic registry used by banks to transfer mortgages), and once as a notary. All of the signatures are different. The partial lien release on the home of Doug Didrick, used to speed up a sheriff’s sale, was submitted to a Collier County, Florida court in April 2015, just one year ago. So this robo-signer still works for a company that forecloses on people for a living. After Marina Boyd, a former corporate human resources manager from Los Angeles, fell into financial trouble, she sought a loan modification to stay in her home. In July 2010 she got approved; all she had to do was send a cashier’s check for $2,000. She did, but the bank said they never received it. The property was sold to CitiMortgage without her knowing about it until the sale went through. After fighting for a year, the sheriff told her to move out in September 2011; she left with the clothes on her back, expecting to be able to come back for her possessions, most of which were boxed up. Boyd begged the real estate agent in multiple phone calls to allow her to pick up her stuff. But one day she went by the house and everything was gone. “I called the agent and said ‘where’s my property, who took it?’” Boyd said. “The agent said ‘it’s gone, that’s it,’ and hung up on me.” Boyd, acting as her own lawyer, discovered that Citi explicitly instructed the real estate agent to haul everything away, offering him thousands of dollars to do it. “Task opened for the trashout… amount approved is $3,050… please get it done ASAP,” reads one email Boyd obtained in the case. The case is still in court, as years of discovery requests and attempts to depose Citi employees continue. There’s a trial scheduled in June. “Access to justice shouldn’t take five years,” Boyd said in a recent article posted at a website she created about the case. She’s made a video about the case too. Just last month, a Dade County, Fla., Circuit Court judge dismissedHSBC’s foreclosure case against Joseph Buset. HSBC had cited an alleged 2012 mortgage assignment from Freemont Investment and Loan, a company that was liquidated in 2008. 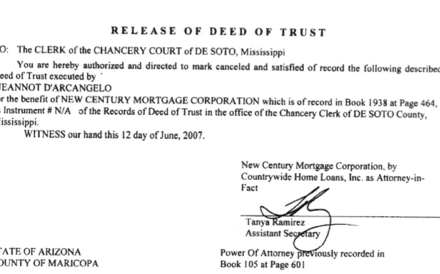 HSBC claimed they had bought the mortgage directly from the defunct company, but the judge ruled that the 2012 document reflected “a transaction that never happened,” was “created for purposes of litigation,” and failed to establish proof that HSBC is the proper owner and holder of the loan. It’s one of many cases out of Florida that have been reversed recently for lack of standing to foreclose, years after the issue was supposed to have been resolved. On May 7, protesters sought to stop the eviction of Barbara Campbell, a wheelchair-bound former Girl Scouts director, from her Detroit home. 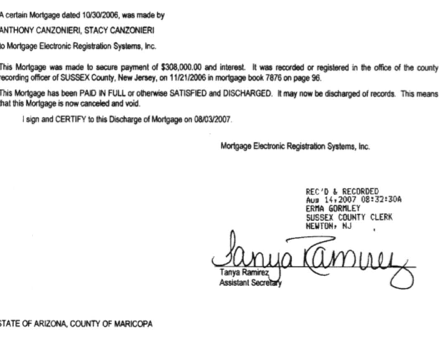 While seeking a loan modification in 2013, Campbell was told by her mortgage servicer, Nationstar, to stop making mortgage payments while they reviewed the request. The servicer then immediately moved to foreclose, citing the “failure to make mortgage payments.” A different bank, Flagstar, is the plaintiff in the foreclosure case, despite not having definitive proof that it owns the loan, according to activists with Detroit Eviction Defense. You can see at the Detroit Eviction Defense websitethat they fight dozens of similar cases. 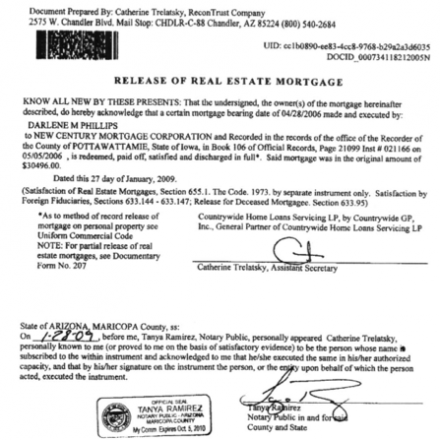 This entry was posted in Uncategorized and tagged foreclosure, loan modification, Wall Street. Bookmark the permalink.